Last year we had our first ever faux tree. It was about three feet tall and we sat it on one of the boys' little tables, and piled the gifts under the table. It was, as Goldilocks would say, "just right". Earlier this year we used the tree as a prop in a theater production, and when the show was over, someone asked to buy it off me. Since we were planning to move to Macau and would have no use for a tree that uses 110 volt electricity, I bid the tree goodbye. 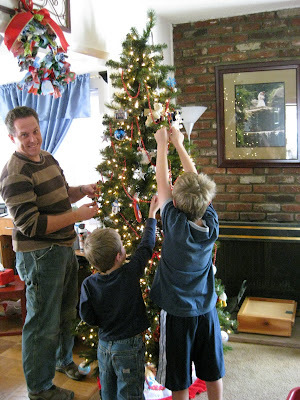 Fast forward to this year when we found out that we sold the tree a bit prematurely. Oops. We were recently up at my Mom and Dad's house and noticed out in their storage that they had a 7 foot faux tree in a box. I stomped my feet into the house and with pointed finger and hand on hip confronted my Dad about the tree... after all, we NEVER had a fake tree growing up, AND my parents ALWAYS buy a LIVING tree in a pot that they then plant on their property. In my mind, a fake tree for my parents would be like... well, not having Christmas at all! My Dad said that last year the price of living trees at the local nurseries were through the roof and they got a good deal on the fake one, so they bought it. Hmmpht, I said loudly. A fake tree may be acceptable for us, but will NEVER do for my parents! Tradition! A few weeks later, my Dad called and said they'd just purchased a living tree from a nursery in town, and asked if we would like to borrow (not keep) the fake one. Yes, please, I said. Money is tight, and we're fine with a borrowed (recycled!) tree. 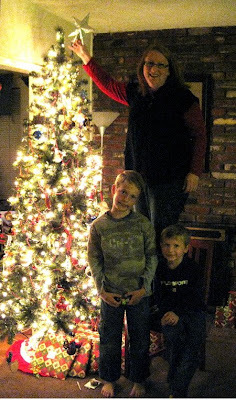 So we set up the slim-silhouetted 7 foot tree and let the boys go crazy decorating it. Ben would pile five ornaments to a branch, and Nathan enjoyed just playing with the ornaments (we have several made of Lego bricks). And when it was all decorated, I put the star on top. Which has been my job since... well, as long as I can remember. Tradition!